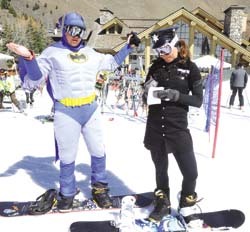 Costumes and music, games and food rounded out the final days of skiing on Bald Mountain last weekend. The skier count for Sun Valley Resort's 2011-12 ski season—which closed Sunday afternoon—was 382,128. That's a slight dip compared with the resort's 407,537 skier days last season. "I'm very proud of the mountain experience we delivered this season given the challenges Mother Nature presented," Tim Silva, Sun Valley Resort vice president and general manager, said in a news release. "It is a testament to the skill and dedication of the entire mountain team." On Saturday, skiers and boarders flocked to the slopes for a final taste of spring skiing. A party at the upper Greyhawk parking lot at the Warm Springs base of Bald Mountain brought out revelers and also campers who were in for the long haul. Picabo Street was closed to traffic, allowing the Random Canyon Growlers, a bluegrass band from Jackson, Wyo., to entertain the crowd until the evening. Sunday in Warm Springs started off with the Ski Patrol appreciation breakfast, organized by Scooter Carling and the "PK Boys." In a tradition more than a dozen years old, volunteers fed ski patrol and mountain staff about 120 breakfasts. River Run festivities involved games for kids, a bouncy house and music by Old Death Whisper. Despite the dip in skier numbers, the season could have been much worse if Sun Valley relied exclusively on Mother Nature. Major snowstorms didn't come until well into the season, but the resort's elaborate snowmaking and grooming operations ensured good skiing with or without it. The area's entire economy relies heavily on those operations. Indicators of average weekend occupancy this winter showed 61 percent occupancy, compared with 63 percent last winter, as reported by hotels in Sun Valley and Ketchum. The figures were presented by the Sun Valley Marketing Alliance to a joint meeting of the Ketchum and Sun Valley city councils Monday. "You could imagine what that number would look like without snowmaking," said Ketchum Mayor Randy Hall. Sun Valley Councilwoman Michelle Griffith agreed. "Everybody [in the West] was in a drought, and we were better off than most places," she said. Michael Berry, president of Lakewood, Colo.-based National Ski Areas Association, attributed lower skier counts to one main cause. "The single biggest impact is weather," he said. Berry also credited resort owners Earl and Carol Holding for investing in snowmaking. "The investment they've made in the mountain, the commitment they have made to snowmaking, has allowed Sun Valley to do the business they've done in recent years," he said.